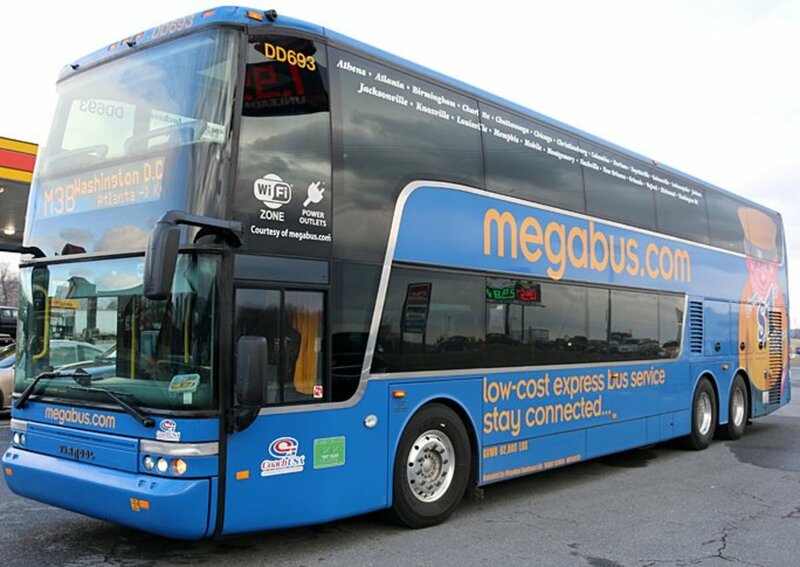 If you are planning to take a trip with Megabus for the first time, then there are a few things you need to know. Listed below are ten tips that, if followed, will ensure that you have an enjoyable trip and arrive at your destination without any complications. Book your ticket early (find out how to get the best deal on your ticket below). Learn the Megabus ticketing procedures and which numbers are the most important. Locate your exact departure and arrival spots on a map. 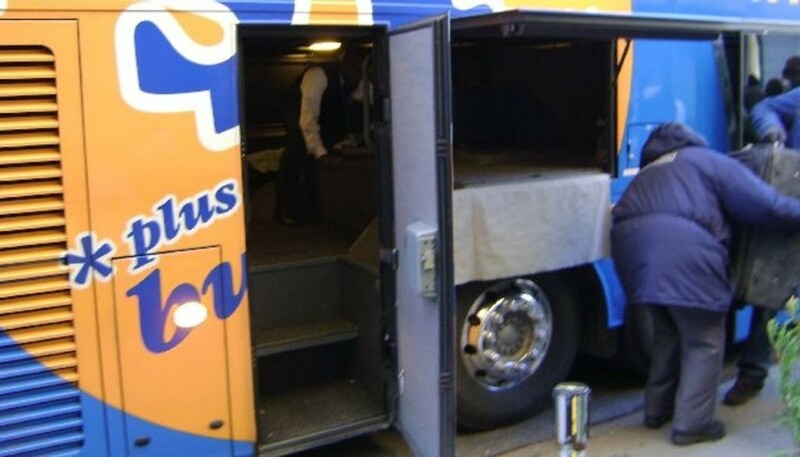 Learn the strict Megabus luggage requirements and restrictions. Passengers with only carry-on bags will board first, while those with extra luggage will line up to stow that luggage first. Learn about eating, drinking, and meals on the Megabus. Bring items to make your trip more comfortable (see the list below). Know your way around the Megabus: Upper deck, lower deck, bathroom, etc. Learn how to avoid getting left by the bus. Know what to expect with plugs, Wifi, and other amenities. You'll find more information about each of these tips below. Megabus offers some of the best values around when it comes to advance purchasing of tickets. By booking a month or more in advance, I've been able to score tickets for as low as $1. How can I get cheap Megabus tickets? The trick is buying early. When I can't get $1 tickets, I am still consistently able to find $5 and $10 fares. I've done a lot of traveling around the U.S. by bus and I have to say that these Megabus deals were the cheapest bus tickets I've ever been able to find. Sometimes you can find these low fares on Megabus without booking weeks in advance. But I say: why risk it? As soon as you find out you are going to be taking a trip, go online and buy your Megabus ticket and ensure that you get the best deal. Megabus offers you the option to reserve select seats on their buses. 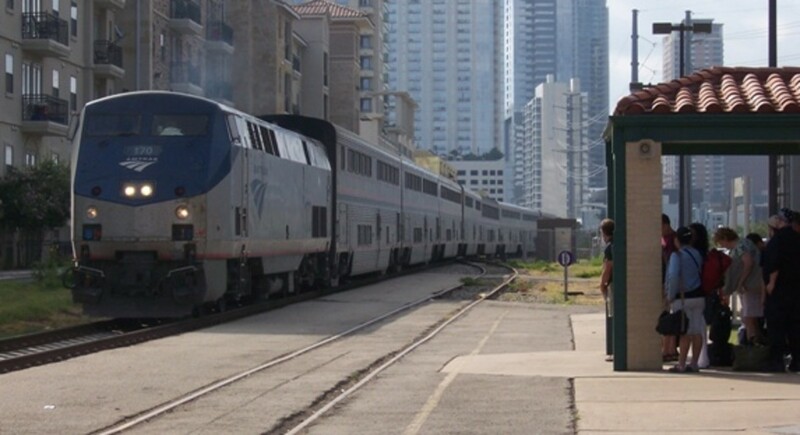 This is a great feature, especially if you are traveling with a companion. On other major bus lines, you and your friend(s) might have to sit apart since there is no way to guarantee getting specific seats. Reserving a seat on the Megabus not only ensures that you can sit with friends, but it also lets you pick where exactly you want to sit on the bus. 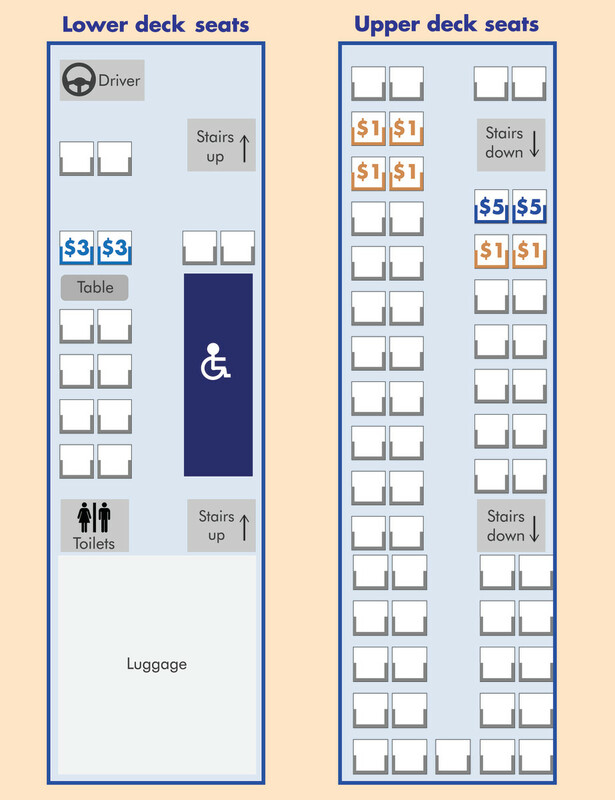 Not all seats are eligible for reservation, but there are seats on both levels to choose from. And, best of all, it's only $1 extra to reserve most seats! Some of the more sought-after reserved seats cost a little more, but I've never seen the price to reserve a seat exceed $9. Do I have to reserve a seat on Megabus? No, you don't. Most seats are general seating, and if you board on time with appropriate carry-on luggage, you'll have no problem getting a good seat. Which are the best seats on a Megabus? The reservable seats you see on the chart are the ones most people prefer. Lots of people prefer to sit towards the front of the bus, especially if they suffer from motion sickness. The upper deck has a panoramic view out of the windows, so lots of people prefer the top deck. There's only one group of four seats that has a table. It's on the lower level, just behind the driver. Most people prefer not to sit near the bathrooms. The seats behind the stairs have more legroom. The upper floor's ceiling is lower than the bottom, so some people prefer to sit below. Some prefer window seats, since the view is better and you can lean against the window to sleep. 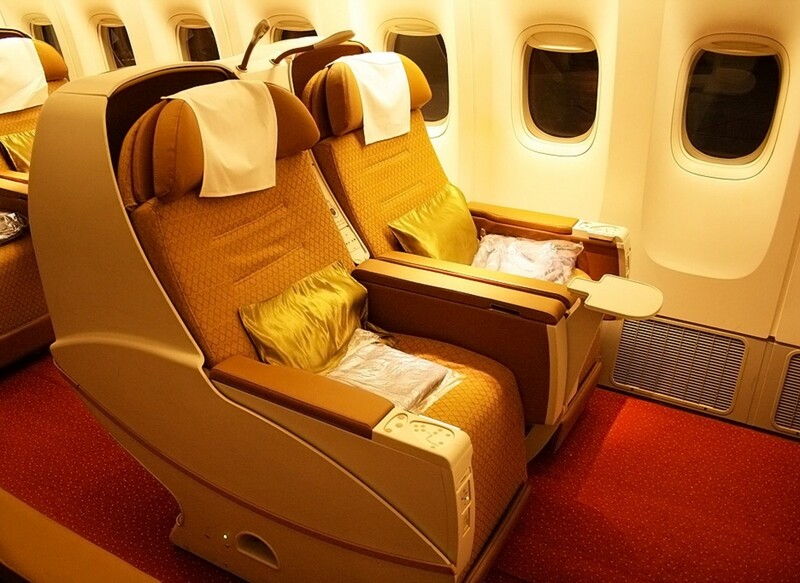 Some prefer aisle seats, since you can get up and move around more easily. When you buy your Megabus ticket, you will receive a confirmation email that will contain a reservation number. This reservation number is very important because it is basically your ticket. You will show this reservation number to the Megabus driver/employee when you are boarding the bus. 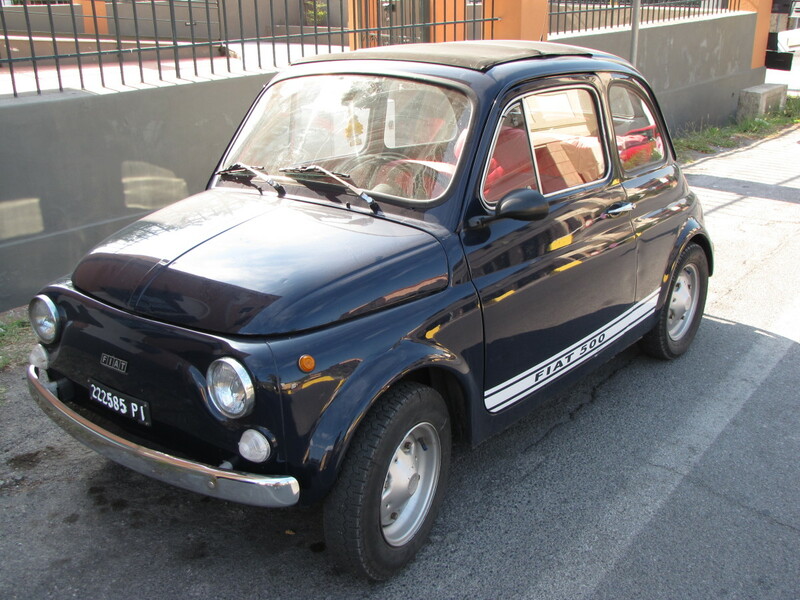 The driver will ask for the first five numbers/characters of your confirmation number. Do I need to print my Megabus ticket? You can either print out the confirmation email or pull it up on your phone when you are boarding. Just show your phone to the driver. Megabus allows you to reserve select seats starting at only $1 extra per ticket! All Megabus stops are not official stations. This means that you might be getting picked up or dropped off at a random sidewalk in the middle of the city. For this reason, I highly recommend that you go online and check out the location of the departure and arrival points on your Megabus trip. When you are purchasing your ticket, the addresses for the pick-up and drop-off locations of your trip will be listed. I typically copy and paste these locations into Google Maps and use the Street View feature to check out the surrounding area. Megabus has very simple (and strict) luggage limits. 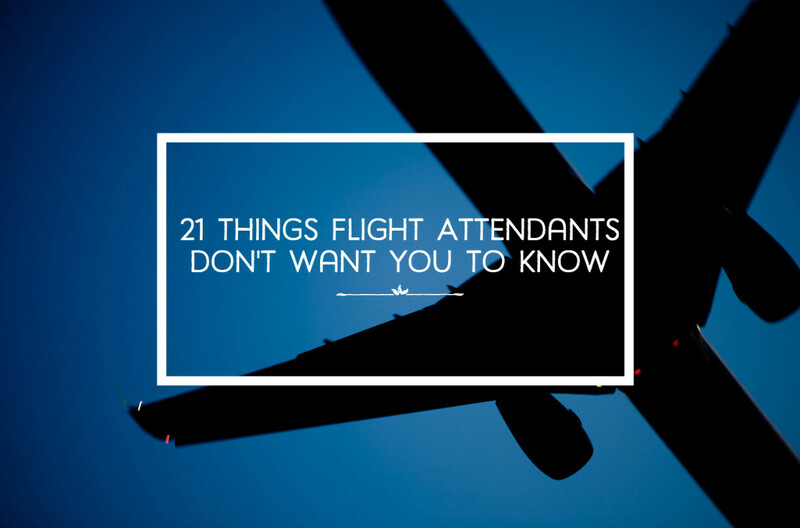 You are allowed one small carry-on bag and one checked bag. Your carry-on bag should be able to fit under your seat or in the overhead bin. Your checked bag that will be stored in the bus luggage compartment throughout your trip. What if I bring extra luggage? 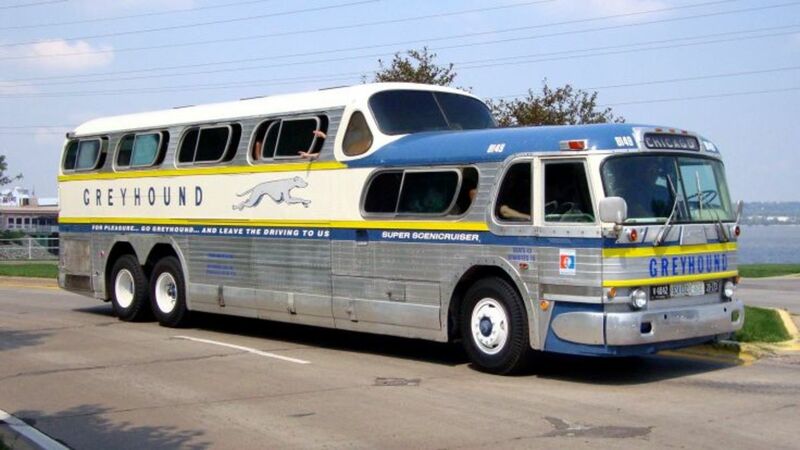 Unlike other bus lines—like Greyhound, for instance—Megabus has no options for traveling with additional luggage beyond those limits. If you show up with more than one checked bag, or if your bag weighs more than 50 pounds, you won't be able to just pay an extra fee and get the other bags on the bus. One checked bag means one checked bag, period. So follow the luggage guidelines and you won't have any problems. If you show up with more than one checked bag, you won't be able to just pay an extra fee and get the other bags on the bus. You are allowed on carry on bag and one checked bag with each Megabus ticket. Your checked bag will travel in the luggage compartment under the bus. Make sure you bring some water as well as a few snacks to munch on during your Megabus trip. Your bus will probably stop for at least one meal break during your trip (if you travel for more than 5 hours) but you may get hungry or thirsty before and after the break. 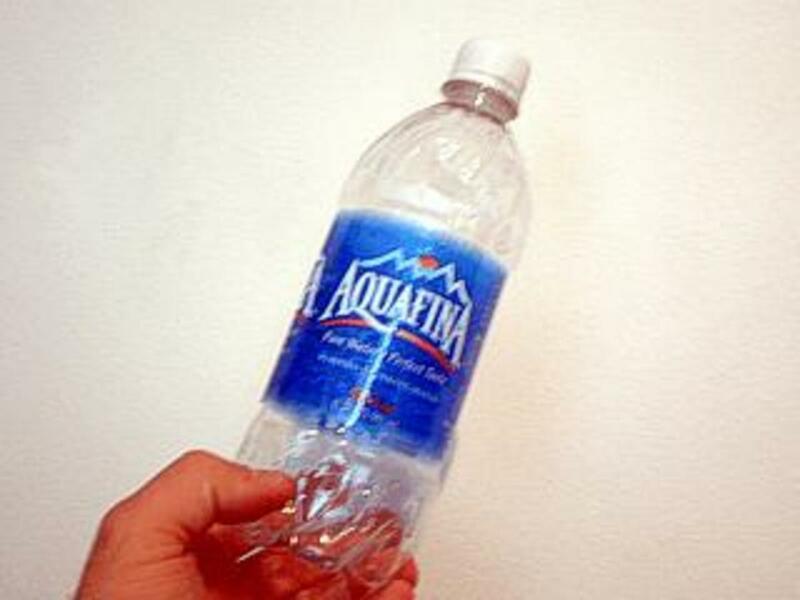 I always bring a reusable water bottle when I'm taking a bus trip and refill it for free whenever the bus stops. The temperature on the Megabus can differ from bus to bus. I've found that the temperature is usually slightly cooler than average room temperature. That's why I always recommend bringing along a light jacket or a travel blanket to keep warm. 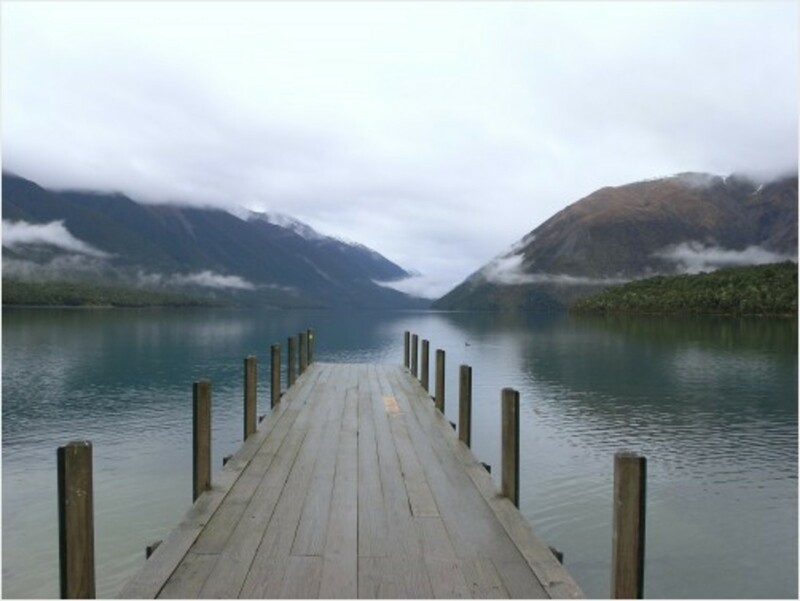 You don't want to spend your entire trip shivering from the cold. Plus, a small jacket can double as a pillow when you are trying to sleep. And a travel blanket can definitely help you when you are trying to catch some ZZZs. The ceiling on the top level is low. Here's a quick bit of information that I wish I had known prior to boarding the Megabus. The ceiling on the upper deck is lower than the ceiling on the lower level. This means that if you are a taller person, you may want to pick a seat on the bottom level. It's not a huge issue. I'm 6'4," and I usually sit on the upper level, but it can be a pain having to stoop and bend down some when you are boarding and exiting the bus. Yes, they do. There is one unisex bathroom at the back of the lower deck. It's quite small—not unlike an airplane bathroom—so many riders prefer to wait for the bus to pull over to use the restrooms. The scheduled meal breaks on your Megabus trip will have a time limit. And when the allotted time is over, the bus will leave. Even if you are not on the bus, the bus will leave. The bus driver will do her best to ensure that all passengers are back on the bus before departing, but if someone can't be found, then they will assume that person has ended their trip and the bus will depart. What if I'm late returning to the Megabus? This is one tip that I can't emphasize enough. I've seen too many people almost get left and have to run for the bus because they didn't listen when the driver told them how long the break would be. The bus doesn't leave on your schedule. There are 50+ other people on the bus who all want to get to their destination on time. So be considerate to your fellow passengers and get back to the bus at the proper time. When the allotted break is over, the bus will leave. Even if you are not on the bus, the bus will leave. It's important to pay attention to the time at meal/bathroom breaks on your Megabus trip so you can be back on the bus before it leaves. Yes, there are power outlets for charging electronic devices on the Megabus. There is also free Wifi. But do not expect either to work all the time. Do Megabuses have outlets to plug into? You will occasionally find yourself aboard a bus where the power outlets don't work on the row where you are sitting. This is normal. If possible, just move to another row. If no other seats are available, then you'll just have to deal with it until another seat becomes available. Is there free Wifi on a Megabus? The same is true with the Wifi. Although there is free Wifi, sometimes it just doesn't work on certain buses. And this isn't just a Megabus issue; it happens on all the major bus lines. You can try mentioning the lack of Wifi to the driver, but chances are there is nothing he can do about it. You will probably just have to deal with it until you get to your destination or you change buses. I know this isn't the answer anyone wants to hear, especially if you planned on using the Wifi throughout your trip, but it's the truth. I recommend charging all devices to 100% before boarding the Megabus just in case you have a power outlet issue. I also recommend downloading movies and TV shows onto your device to watch during your trip in case the Wifi is down. Or you can go really go old-school and bring a good book to read or talk to fellow passengers. Worst case scenario, you can curl up in the blanket you brought with you (remember Tip #7) and sleep the trip away. And don't forget your headphones! 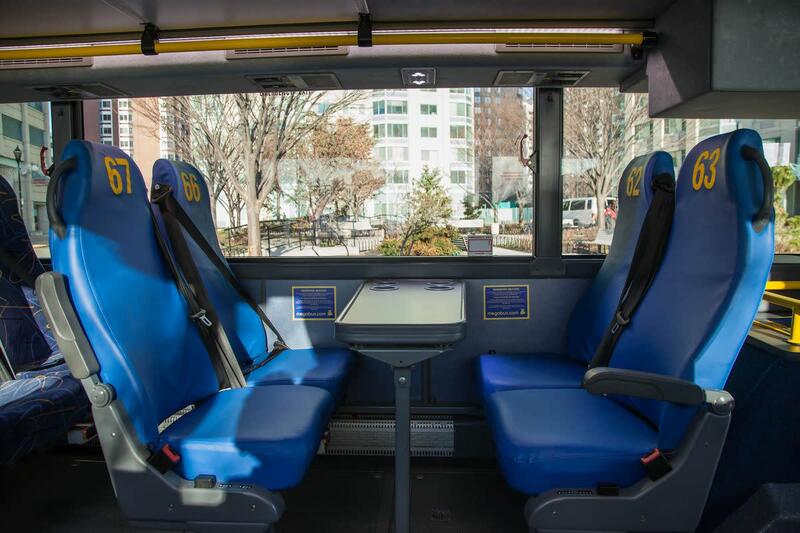 Your first Megabus trip will be an experience you will probably never forget. Hopefully, you will use the tips mentioned in this article to get a great seat at a great price and arrive at your destination on time, happy, and hydrated.